Students and staff from the Law Clinic with British Red Cross staff at the charity's centre in Plymouth. 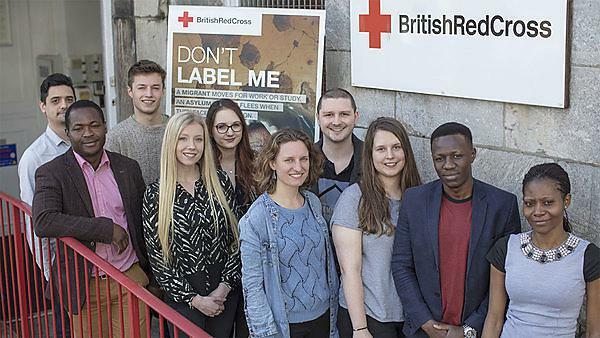 A project in which university staff and students work with refugees and the British Red Cross has contributed to a campaign to make it easier for displaced people to be reunited with their families. Ahead of the second reading of MP Angus Macneil’s Refugees (Family Reunion) Bill today, Friday 16 March, a group from Plymouth’s Refugee Family Reunion project travelled to Westminster to take part in a parliamentary event organised by the British Red Cross. The charity is supporting the bill, which seeks to relax the strict rules around family reunion. The event saw the Red Cross present a report on the impact of legal aid cuts for asylum cases, and MPs and others in attendance heard moving testimony from those with first hand experience. One of these was Didier (not his real name), a refugee from Cameroon now living in Plymouth. He was accompanied by Senior Lecturer in Law at the University of Plymouth Rosie Brennan, Director of the University’s Plymouth Law Clinic, which supported him through the difficult legal process of being reunited with his wife and five children. Didier told MPs he had spent almost three years in the UK alone before his family were allowed to join him. Although he produced extensive evidence about his family, his first application for them to come to the UK was refused. A second, successful application was prepared, but despite support from the Red Cross, and legal work carried out pro bono by students and staff in the Law Clinic, the financial and psychological cost to Didier was severe. Although earning from his job as a tailor, he ate nothing but white rice and oil for days on end, as he channelled every penny he could into the costs of the case, and sending money home to support his family. “I was lucky to have been supported by the Red Cross and University of Plymouth joint project, because without their legal advice, I would not have seen my family. Didier was supported through the Refugee Family Reunion project, in which the Plymouth Law Clinic works in partnership with the Red Cross in the city to offer crucial legal advice free. The project works to reunite refugees who have come to Britain with the families they have left behind, often in difficult and dangerous situations, through legal and other support, and has led to several other families being reunited in this academic year alone. According to Ms Brennan, an expert on asylum and immigration law, the project and the voluntary sector in general have become increasingly important since legal aid was withdrawn for immigration cases in 2013. As a ‘dispersal city’ for those coming to the UK, Plymouth welcomes many refugees seeking asylum, but few are able to pay for legal representation for family reunion. Scottish National Party (SNP) MP Mr Macneil’s bill would also see legal aid reinstated in such cases, and comes as a major review of legal aid is being undertaken by the Ministry of Justice. “The frustration is that when Didier first came to the UK and claimed asylum, he spoke at length about his family. Obviously he had a family, but the officer refused to accept the evidence. Appeals take time, so we decided to make a new application, as he was getting more and more desperate. But it never should have been refused in the first place. “The work is legally, evidentially and emotionally challenging. People separated from their family, many of whom have suffered previous trauma, are distressed and constantly anxious about their close family members who may be in danger – they frequently find it difficult to think about anything else. “Students work in the BRC office alongside Red Cross staff and volunteers, so get a real sense of all aspects of the work. Our partnership with the BRC has been so positive. Watch Rosie Brennan and a Red Cross colleague talking about their work supporting refugees, at the launch event of the Displacement Studies Research Network in January. Coordinated by students and supervised by staff and practitioners the Plymouth Law Clinic runs a range of pro bono projects and offers real advice and representation to clients, making a genuine difference to people’s lives.